PETALING JAYA (Sept 7): Central i-City Shopping Centre, a joint-venture development by I-Berhad (I-Bhd) and Bangkok-based property developer and investor Central Pattana Public Co Ltd (CPN), is scheduled to open at the end of next year. The construction of the six-storey shopping mall at i-City in Shah Alam, which has a lettable area of 940,000 sq ft with approximately 350 shops, started early last year and has now reached the fourth floor of the first section, or approximately 30% of the overall construction plan. The project has a gross development value (GDV) of RM850 million. CPN Thailand executive vice-president (marketing) Dr Nattakit Tangpoonsinthana anticipates the new mall to offer a new shopping experience to Malaysians. “We aspire to integrate and share the strength of two cultures, which are Thai hospitality and Malaysian friendliness, to deliver extraordinary services and create the complete lifestyle experience for all to enjoy, locally,” he said in a press statement today. The developer highlighted the fact that this is notably CPN Thailand’s first project abroad and represents its first step towards becoming a regional player. 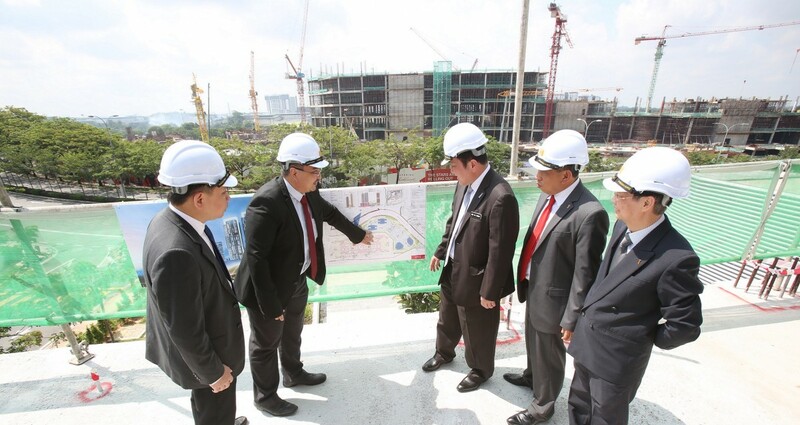 Second Minister for International Trade and Industry Datuk Seri Ong Ka Chuan was invited to i-City today to view the progress of Central i-City Shopping Centre. In his speech, Ong noted that the mall’s construction is on schedule and once completed, it is expected to create a multiplier effect on the property, construction and tourism sectors. “i-City is also an intelligent city with its own last mile infrastructure and Internet-of-Things (IoT). The advancements of the IoT platform, which has been incorporated into i-City’s property and theme park development, could provide better convenience to the visitors,” Ong added. I-Bhd deputy chairman Datuk Eu Hong Chew said i-City was planned as an investment location for global companies focusing on the knowledge and tourism sectors, thus the joint venture between CPN and i-City could continue to draw foreign direct investment to Malaysia. CPN is Thailand’s largest retail developer with more than 35 years of experience. Currently, it manages 30 shopping centres, with near to 70 million sq ft of gross floor area of space under its CentralWorld, CentralPlaza and Central Festival brands. The company also has a track record in managing office buildings, hotels and residential projects.